Redco™ PTFE (Polytrifluoroethylene) offers outstanding properties making it the ultimate choice due a multitude of applications. Redco PTFE has the lowest coefficient of friction, no water absorption, is self lubricating, has excellent chemical resistance and a high temperature tolerance (+500F). Redco™ PTFE is very non-reactive, and so is often used in containers and pipework for reactive chemicals. 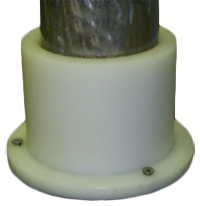 Its extremely high bulk resistivity also makes it an ideal material for fabricating long life electrets, useful devices that are the electrostatic analogues of magnets. As well, because of its extremely low coefficient of friction, it is used for applications where sliding action of parts is needed: bearings, bushings, gears, slide plates, etc. 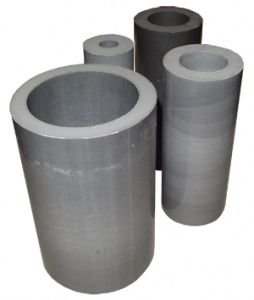 In these applications it performs significantly better than nylon and acetal; it is comparable with ultra high molecular weight polyethylene (UHMWPE), although UHMWPE is more resistant to wear than PTFE. For these applications, versions of PTFE with mineral oil or molybdenum disulfide embedded as additional lubricants in its matrix are being manufactured. Other varieties available: PVDF (Poly-Vinylidene Fluoride), Fluorosint, FEP (Fluorinated Ethylene Propylene), PCTFE (Polychlorotrifluoroethylene), and ECTFE (Thylene-Chlorotrifluoroethylene).